This week Jeff Morris, President of All A Cart Manufacturing, Inc. and lifelong entrepreneur with a knack for continually pivoting into profitable industries joins me on the pod waves to outline three mobile food businesses you can start for under 25 grand. Morris’s business life started with a popular brand of retail floral chains. Eventually, Morris was able to get his flowers into grocery stores with the help of Kroger, the parent company of Food 4 Less., Ralph’s and other popular grocery chains. This opportunity got Morris into the manufacturing business by building refrigerated flower carts. Overtime, people started to ask if he could build everything from hot dog carts to food trucks and All A Cart Manufacturing, Inc., was born. In addition to hearing Morris’s personal story, he also shares three food businesses that entrepreneurs can start with a minimal cash investment and provides an overview of what the day-to-day operations of the business entails. This is the lowest cost entry point for the mobile entrepreneur. You can sell hot and cold products with a trike, including ice cream, drinks, and pizza. The only catch is that these products would need to be pre-packaged. In order to cook items you need access to running water due to health code requirements. Realistically, it would be difficult to truly cook much of anything on a trike anyway. According to Morris, this business is built for impulse purchases in high-traffic areas. Baseball games or farmer’s markets are good examples of this. One advantage to using a vending trike is that you can access locations that other vendors can’t get to due to small size of the equipment. Base Price: $2,000 and up. Unlike trikes, there’s really no limit to what you can sell and create with a food cart. Some common examples of food carts, include the traditional hot dog stand. These are essentially miniature kitchens that can include grills, griddles, sink systems and warming areas. One importance point to consider is the size of your cart. The larger the cart, the more product you’ll be able to have onboard. This is key point to remember as you’ll want to be able to take full advantage of lunch rushes without the need to restock. The standard size of a food cart is about 4 feet wide by 3 – 6 feet long. In most cities this is the foot print that you’re limited to. As usual check the local laws and regulations to ensure you’re investing in a cart that can be used in your city. Base Price: $6,000 and up. If your goal is to start a catering business or a have a longer term fixed location that you plan to sell from pop-ups or kiosks can also be an option for you. The type of business you start will dictate the cost of your business here. For example if you’re in the espresso / coffee business the coffee maker alone could cost you $15,000. Base Price: $15,000 – $20,000 and up. The importance of listening and responding to customer requests. Why sticking to classic American food can be a reliable way to build a business. Pizza will never go out of style. 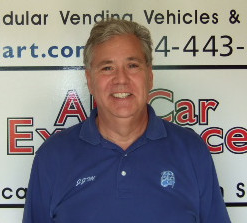 All A Cart Manufacturing, Inc. – This is Jeff Morris’s business. They manufacture vending trikes, food carts, pop-ups, food trucks and more. Kroger – The company that worked with Morris to put flowers into grocery chains. S’witch It Up Case Study – Follow along with Anthony Salvagno as he builds his business. Recently, Salvagno invested $35,000 into a a truck and shares his experience. Get a Quote – Are you paying too much for trailer or truck insurance? Find out by completing this 4-minute form. iTunes – Leave a review and get your comments read live on the show. 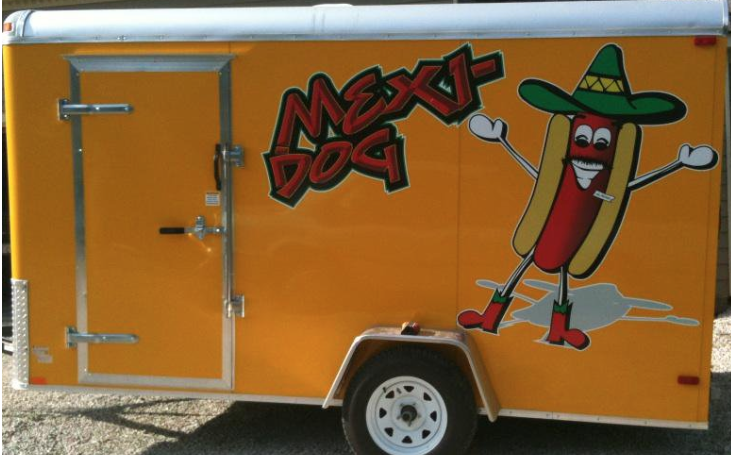 Mexi Dogs – Listener Travis is launching his own food trailer with two partners. Follow him on Twitter to connect and keep up to date with the progress of his business. Related Content: A couple interviews I’ve conducted in the past about low-cost businesses. How a Hotdog Stand Saved My Life – My first ever interview.